Product #3631 | SKU 1SKB-DH3315W | 0.0 (no ratings yet) Thanks for your rating! The SKB-DH3315W Mid-sized Drum Hardware Case is a rotationally moulded of Linear Low-Density Polyethylene featuring a telescoping lift-off cover design with ergonomic built-in handles and nylon web cinch closures. With an injection moulded pull out handle and built-in roller blade wheels this smaller hardware case will go anywhere. 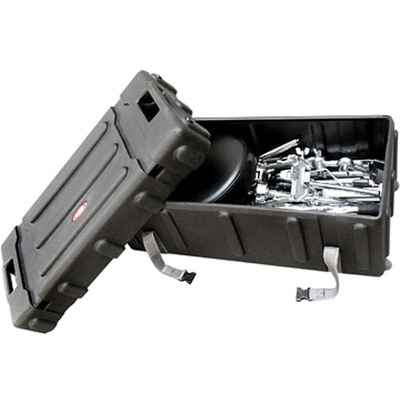 Perfect for the gigging drummer, the SKB-DH3315W Mid-sized Hardware Case can easily fit in the back seat of a car.